Yesterday, on the spur of the moment, I was invited to a friend’s home for lunch. She had the day off unexpectedly and as she prepared her lunch, she wanted someone with whom to share the meal. A quick phone call and two of us set aside our plans for an even better plan. We arrived at noon to a table set with chicken salad, pears and cottage cheese, ripe red tomato wedges, and tapioca pudding with raspberries. A delicious simple meal, made excellent by laughter and friendship. We used everyday dishes and laughed that she’d put off her cleaning to prepare lunch – so once we left, she had to dive in to do all the cleaning that we didn’t notice needed to be done. While we often think of daintily set tables with sparkling china, silver, and crystal as the criteria for hospitality, it was my friend’s joy in serving and being with us that made everything sparkle. Several time she remarked how glad she was that we could come. I’m not sure I’ve ever felt so welcomed, so wanted. Even today, I still smile as I think of her enthusiasm of hospitality. The joy on my friend’s face will remain a very special memory as well as a reminder that God loves when we offer hospitality. To me one of the most precious gifts from God is the privilege to call Him my Father. My earthly father was a man of deep faith in God. A man of strength and wisdom. A humble man who enjoyed being with people. A man who adored his family and wanted to protect them. One of the most important, yet invisible, ways that Dad protected me was to teach me to make good decisions. And he trusted me to make good decisions. When we were in college, my brother and I had to turn in permission slips, signed by a parent, if we were going to be off campus overnight. Dad was over 1,000 miles away and could only send permission by the US Postal Service. This did not work very well. And it annoyed my Dad. We can only protect our kids for so long before it is time for them to grow up and take on the responsibilities of life. Those growing up years are our opportunity to teach them right from wrong, how to work, how to play, how to trust God and our opportunity to be there right beside them while they are learning and to step in if and when they need us. All these memories came flooding back as I viewed pictures posted by a friend on Facebook. Mom and Dad and little Miriam went to a branding in the Sandhills of Nebraska. I needed a quick lesson on the process as I’ve never been to a branding. You partner up with someone and stand in the ‘wrestling line.’ Once the calf is roped (on its hind legs) one will hold the line taut while the other makes sure the head end of the calf is on the ground. Of course, it takes some wrestling to get it to the ground. It takes quite a bit of strength to hold them down while they are branded, and perhaps given a shot. But these things are for the calf’s safety and health. Miriam asked if she could wrestle with her dad. (By now you know this means something completely different than we would expect!) She was excited to be standing next to her dad, waiting for their turn. I could see her excitement in the pictures. And then it was their turn. She wasn’t afraid – because her dad was right there beside her. 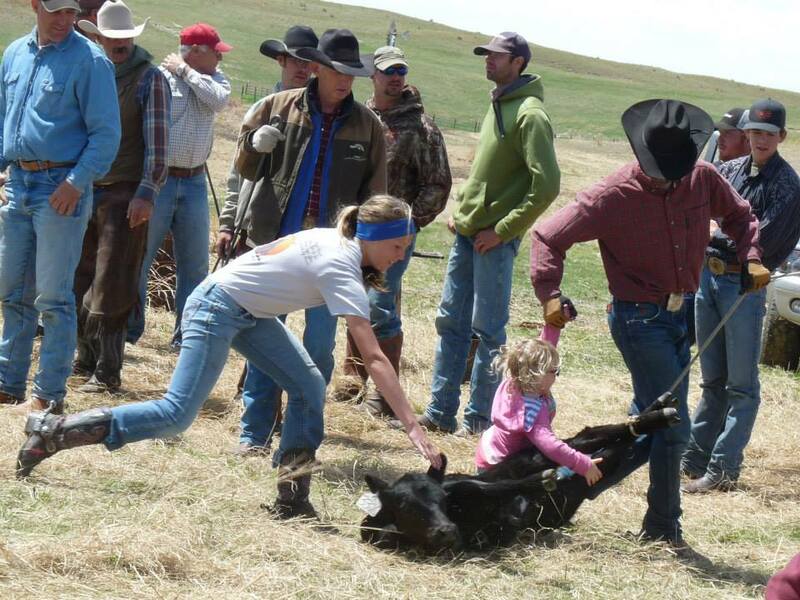 She’d watched others get the calf down and she was ready to do her part. Right in there. With all her energy, strength, and joy. And then came the picture that brought tears to my eyes. Dad has a hold of the rope, but you can see he has a strong grip on Miriam as she steps in to hold the calf down. That reminds me of the grip that God has on me. I am in this world to glorify Him. Sometimes to do hard tasks. He never sends me in alone. He’s not afraid to teach me or to give me opportunities a bit beyond my strength or abilities because He is my strength. He gives me the energy, strength, and joy that I need. There is nothing I can’t do when I am in His grip. Heavenly Father, I’ve been thinking. Pondering things in my heart. I remember back to Youth Group as a teenager. I remember how others were so excited over hearing that you loved them. That Jesus died for them. I remember their energy of being a new believer. By then, I’d been a believer for over a decade. Excitement had changed to thankfulness, contentment, commitment. But, I felt like I was missing something in not being overtly happy all the time. Not being a Jesus Freak – after all, it was the 60s and 70s. I was just a quiet girl who went to church, studied her Bible, and believed in You. I still feel that way sometimes. All the books and songs that encourage me to ‘fall in love with Jesus’ make me wonder what is wrong with me. I don’t have that excitement. I don’t have stars in my eyes. Much of the time, I have tears in my eyes. I don’t shout ‘Hallelujah’ or raise my hands. I stand there quietly. Thankful. Content. Believing. I struggle with trying to understand how I can love you with all my heart, with all my mind, and with all my strength. Then I read John 14:15 again. “If you love Me, you will keep My commandments.” I realized that proof that I love You doesn’t come from my feelings. It comes from my obedience. I have studied Your Word and I know your commandments. I know how each of them has been a struggle in my life. I know when I have chosen to obey You – saying ‘No’ to what I desired. And I know when I have failed. I love you, Father. Give me the strength to continue to show You my love through obedience. Let me love still more. This morning I relived a childhood memory. With a piece of buttered toast dunked in hot chocolate, I remembered Saturday mornings as a child. My brother and I, still in our pajamas, sat on the floor in front of the television watching Mighty Mouse (“Here I come to save the day!”), Fury, Sky King, and My Friend Flicka. For breakfast, Mother made us hot cocoa and buttered toast. If the butter was a little hard and unmelted, dunking it in the steamy hot chocolate would make it melt. Oh, it was good to eat! When I was two I asked for ‘hot cocoa toast’ for breakfast and the name stuck. On special mornings, we would even have a donut. Dunking even days-old donuts in hot chocolate make them soft and warm, as if they just came out of the fryer. I remembered shopping with my Mother on the Square. We almost always did our grocery shopping at Lindy’s Market. They were family – not one of those big chain stores like A&P or Kroger. And they were close. We could walk there because my mom didn’t drive. At the checkout, my brother always got to buy baseball card gum. He didn’t really care for the gum, but those baseball cards were gold. I’d get to pick out some candy, too. Wax bottles, Baby Ruth, Slo Poke, Chuckles, Milk Duds, Hershey’s – I’d try something different each week hoping I’d like it. There was one check out counter and we had to open the door ourselves – unless it was summer. Then the screen door pushed open easily. After paying, we’d walk next door to Leonard’s Bakery. I remember the outside of the building being pink. I wondered why. Inside, it was one big room with ceiling fans hanging down from a very tall ceiling. And it smelled magical. Three sides of you were surrounded by glass cases of baked items: bread, donuts, Bismarks (jelly donuts), Long Johns, Bear Claws, Apple Fritters, Twists (sugar and glazed), cakes, pies, cookies. We’d get to choose one item for Saturday morning breakfast. We never bought cookies, cakes, or pies because Mother and Grandma were great bakers and it was much cheaper to make your own. Grandma made the best Dutch Apple Pie. It’s not at all like what passes today for Dutch Apple. Grandma would take the transparent apples (hard to find these days) and slice them thin. On her perfect pie crust, she’d layer the apples and pour a mixture of 1 cup heavy cream, 1 cup sugar, and 2 tablespoons of flour. If there was a little extra, she’d pour a thin layer in small pans on pie crust. She called those cracker pies and I loved them. I don’t have any pictures of the old Lindy’s store, or Leonard’s Bakery, or Don’s Pharmacy. We didn’t have the convenience of a smart phone camera. So I must be content with the snapshots in my mind of these places long gone. Taking the time to remember – memories trigger more memories. Lost in thought, I almost feel Mother and Daddy, Grandpa and Grandma here beside me. How thankful I am for the family God gave me. Cozy memories of growing up in a small town, with gardens, and chickens, and trees to climb. Life goes on and new memories will be made. Never forget God’s blessings – past, present, and future. Last night on my way home from a wonderful weekend in Chicago with my daughter, I hit a deer. I was on Route 24 almost to Gridley. I’d been watching my gas gauge, hoping I’d have enough gas to make it to my favorite BP station in Gridley, because they have the cheapest prices (usually). I was driving slower than normal (under 50) to conserve the gas that I did have. It was dark at 5:30 because of the time change this weekend. Driving through the open country I suddenly saw movement to my right. Six or seven deer were jumping out of the ditch, crossing the road. At the same moment, I slammed my foot down on the brake, keeping the wheel straight as there was nowhere to go to avoid them. One did not get out of the way in time and the car thumped into her side. She kept running as did two others behind her. The car had stopped at this point, so they got away unscathed. I was uninjured but the adrenalin was pumping. I moved to the shoulder of the road and wondered what I was supposed to do. A couple cars drove past but did not stop. I didn’t know whom to call. The car was running fine – no blinking lights, no clanging bells, no funny sounds. Then I realized I still needed to get gas – before I ran out! So, I slowly drove to my station and filled up. Then, I looked at the front of my car. It didn’t look too bad. The bumper was unhooked; the grill had the imprints of the impact; the hood had a scar. You could tell that the car hit a heavy object that crumpled it up a bit. No blood. A bit of hair. Still unsure of what to do, I drove home. I just wanted to be home. Once home I made some calls. I called my brother in Hawaii, obviously because he could help even if he couldn’t give me a hug. Then I tried to call the State Police. No answer, so I called the Washington Police Department. A very helpful lady gave me the number of the sheriff department in McClean County. I called and left a message. I called my insurance agent and left a message. Today begins all the effort of estimates, claims, and extra stuff that needs to be done. But right now, I want to stop and thank God for His protection. This was a small thud when it very well could have been a major accident. I’ve heard stories and seen cars damaged by deer. It wasn’t luck. It wasn’t fate. It was God’s protection of me that kept me from serious injury. And I am thankful to Him. Praise Him with me. Yesterday was my birthday. The last one in the decade that brought the most change into my life. The one where I realized I was growing old. I always wondered why they say you are ‘over the hill’ and now I know it’s because, physically, your life goes downhill during this decade. The affects of sin on this world also affect our aging bodies. Kate began my day with a text; Karrie with a phone call. Many friends sent their wishes on my wall on Facebook. One messaged me on Facebook. Several sent cards with special thoughts by snail mail both at home and at work! Two handed me a card and sang to me as they brought in cupcakes. And Kate and I finished the day with FaceTime. Short of skywriting, did I miss any method? Amazing how far we’ve come in ways of communication, isn’t it? Here at RHMA we send out a bi-monthly prayer bulletin. Each day has a missionary and specific prayer requests for that month or day. Yesterday was my day which meant that people, some who don’t even know me, were praying for me. And that, my friends, is why yesterday was a great day, why my knees felt better than normal, why I was content in my day, why my heart was joyful even with the rain. It is an awesome thing to have people interceding with the Almighty God for you. Saturday afternoon I was just finishing the mowing when I felt horrible stings on my left arm. Over and over a honey bee stinger pierced my skin. Natural reflexes took over and I grabbed at my sleeve with my right hand. Again I felt the needle-like pain in my fingers. This had to stop. I lifted back my sleeve and the bee sat on the tips of my fingers. Then, deep throbbing pain hit and I flicked the bee off my hand and cried – holding tight and putting pressure on the pain, praying for God to stop the pain. I sat for a few minutes unsure of what to do, but knowing I had to do something to stop the pain. Deep breaths. I drove the mower into the garage, went into the house, and sat at the computer. Google was useless. GoodSearch gave a site that said “ice” and so I grabbed the ice pack from the freezer, sat on the couch, waited and begged God to make the pain stop. Eventually the ice numbed the skin and the pain lessened. I tried all sorts of remedies to ease the pain when the numbness wore off – baking soda paste, lavender oil, peppermint oil, Tylenol, cold water, more ice. But, only one thing worked. Throughout the evening the pain changed from deep ache to intermittent streaks of pain. By morning some swelling was still there, but the pain was almost non-existent. And I began to wonder why. What could I learn from this painful experience, right now? Life has been full of stings lately. Hearing the news, I grab my heart to lessen the pain from the sting of fear. Of sorrow. Of sadness. Of grief. I pray for God to stop the pain. I try all sorts of remedies. Telling God ways He can solve the problems. Willing Him to heal. Trying to forget the pain and concentrate on other things. But only one thing works. Because in time, God works in my heart to see what He is doing. In time, I remember God’s faithfulness. In time, I remember His promises. In time, the sting of this life lessens because God is so much greater. Because He has promised so much more. And nothing will keep Him from fulfilling His promises.